What could be better than Thanksgiving turkey with all the trimmings and time spent with loved ones and friends? Usually we say “family” and friends, but we all have those certain relatives who like to push our buttons, you know? Well, invite Fido and Meow-man to dinner instead! If you start training early, by the time your dinner event comes around, you will have a well-behaved pet. The AKC.org suggests starting your new training with a simple meal, like breakfast or lunch. If your pet has been successful at begging, stopping suddenly may make them try harder. Hang in there, it will get better. Be sure to check out the AKC.org articles for behavior training. Don’t encourage begging by giving in. It should be a household rule to not feed the pets food from the table, or they will expect it every time you sit down to eat. Do not look at the pet, and do not give them a single luscious morsel. Do not put the cereal bowl on the floor to lick. Attention of any kind will condition the pet to continue their begging. only for table manners, but in other situations. If you are compelled to give them a treat from the table, be sure to only give dog treats. It is never a good idea to give table scraps as they may contain ingredients or spices which are harmful for them. If your guests don’t already know the house rules, gently inform them you would appreciate their cooperation. Another alternative is to put the pet in their crate or in another room with a favorite chew toy or treat. Sharing our Thanksgiving dinner with our pets causes more veterinary visits each year. The Standard American Diet (SAD) contains too much sugar and high saturated fat. Those mashed potatoes with gravy, stuffing and pumpkin pie probably contain ingredients like garlic, heavy cream or cream cheese, seasonings, not to mention Xylitol which is deadly to dogs. These foods are fine for us, but they can be too rich and undigestible for our pets, and can lead to digestive problems including pancreatitis. So please do not give any of your delicious dinner to your pet. Give only appropriate treats instead. How about making a few homemade treats from your leftovers or ahead of time to share with your buddy? Just be sure the ingredients DO NOT include onions, scallions, spices, chocolate, garlic, Xylitol, raisins and grapes, or nuts. Please check with AKC.org for their suggestions on safe foods your pet can eat. You will find their article under Human Foods Dogs Can and Cannot Eat. It should be recommended reading. Or read the article Can Dogs Eat Thanksgiving Turkey? 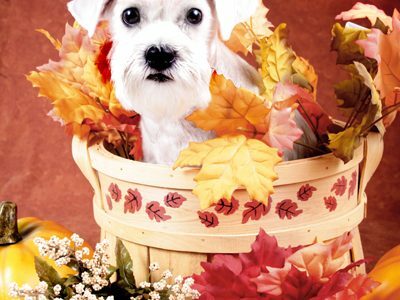 This informative article gives a listing of the typical Thanksgiving menu items which your pet cannot eat. Homemade treats are healthier and can give your dog’s health a boost of essential nutrients. They are fun to make with just a few ingredients. Store bought treats are fine. They usually contain preservatives, most of which are harmless, but are needed to extend shelf life. Recipe 1) Frozen Delight: Pure pumpkin pureé + water + freezer. Tada! Healthy frozen treat! Put this in a puzzle bowl for a longer lasting frozen treat. I usually soften them slightly after removing from the freezer to make it easier for the pet to lick and enjoy. Recipe 2) Frozen Yogurt: You can also mix together a little pumpkin pureé and yogurt as a treat. Omit water. Recipe 3) Pumpkin Cookies: One cup of rolled oats, pulverized + 1/3 cup pure pumpkin pureé + 1/4 cup creamy natural peanut butter. Place all ingredients into the blender and mix until a sticky dough forms. Roll dough out on a lightly floured flat surface. You can use regular, or whole wheat if your pet isn’t allergic, or use more of the pulverized oats as your floured base. Cut cookies with a cute cookie cutter and place on parchment or prepared baking sheet. Bake at 350º for 25 – 30 minutes, or until the treats are hard and dry. Let cool before giving to your pet, then store in an airtight container. Recipe 4) Sweet Potato Chews: recipe courtesy of Sam Turnbull at her blog It Doesn’t Taste Like Chicken. One or two sweet potatoes, sliced into thin medallions about 1/4” thick, and baked at 250º for 2-1/2 to 3-hours on parchment lined cookie sheets. Flip about half way through baking time. Finished product should be shrunken, mostly dried out and chewy. Some may be slightly crispy. Cool, then store in container in the refrigerator. There are lots of fun recipes out there to try at home, but beware. I’ve actually seen recipes online for dog treats using leftover stuffing which usually contains onions, garlic, raisins and nuts, and spices. This is NOT a good idea. These ingredients are toxic to animals. A little discretion goes a long way. Your pet will thank you for it this Thanksgiving. Wishing everyone a safe and happy Thanksgiving Holiday!